Every once in a while a luxury haircare brand comes across my desk that utterly takes my breath away. This perfectly describes my reaction to the beautiful haircare products from Playa. Their performance driven products not only boast serious efficacy, but they are also filled with safe and healthy ingredients, delectable textures and aromas, and they are a serious pleasure to use. Not only do I love supporting eco-friendly brands, but it is also a serious pleasure to support local Los Angeles-based companies. We created the Playa collection of essential hair products so you could have the best of both worlds: safety and performance. We’ve formulated each product to be different from anything else on the market so you get radical results with fewer products. Our team of experts spent years researching alternatives to the harmful ingredients so often found in salon products. We’ve thoughtfully combined natural oils and botanicals with hand-selected clinically active ingredients for products that are truly transformative. We love calling Venice Beach home, and our eclectic community continually inspires our products. While we spend most of our time working on Playa, living a balanced life is important to us. We don’t have an office, ride our bikes instead of drive, and get out to the water and surf every day we have waves. Playa Pure Dry Shampoo ($24.00 for 4 oz. from Playa, Violet Grey, Shen Beauty, Revolve, The Dreslyn and Carbon Beauty Amazon Store): Dry shampoo enthusiasts really need this one! This decadent, and delectably aromatic, dry shampoo effectively absorbs oils, eliminates impurities and refreshes those tresses instantaneously! It is paraben and SLS-free, and is color-safe. Furthermore, it's filled with lots a great botanical ingredients, it isn't sticky, and it leaves hair touchably soft. This rare blend of botanicals and minerals refreshes and revitalizes hair instantly—no shower required. Rose powder invisibly absorbs excess oil at the roots while keeping hair soft; star anise extract treats scalp and eliminates impurities. Breathe body and life back into your hair naturally, whenever you’d like. Directions: Hold product 6 inches from hair and mist, working in 2-inch sections and focusing on the roots. Use fingertips to tousle strands. Use anytime, no chalky buildup or residue. Ingredients: Hydrofluorocarbon 152a, Isopentane, Alcohol Denat., Hexamethyldisiloxane, Dimethylimidazolidinone Rice Starch, Rosa Centifolia (Rose) Petal Powder, Shikimic Acid (Star Anise), Salix Alba (White Willow Bark) Extract, Biotin (Vitamin H), Panthenol (Provitamin B5), Magnesium Stearate, Equisetum Arvense (Horsetail) Extract, Phenyl Trimethicone, Azadirachta Indica (Neem) Leaf Powder, Fragrance. *Ingredients are naturally occuring or plant-derived. Playa Every Day Shampoo ($32.00 for 7.6 oz. from Playa, Violet Grey, Shen Beauty, Revolve, The Dreslyn and Carbon Beauty Amazon Store): This gentle, non-stripping shampoo, effectively cleans hair and leaves it hydrated and manageable without leaving behind any sort of oily residue. The light lather coupled with warm creamy aroma makes using this delectable shampoo a treat to the senses. I need to get the companion conditioner to experience the two together, but my guess is that it is just as incredible as the shampoo. An SLS-free, every day shampoo that’s anything but ordinary. This coconut-derived, every day clarifying shampoo gently foams to remove impurities while preserving your hair’s natural oils. Coconut water weightlessly hydrates; sugar beet extract stimulates roots to promote volume and growth. Your hair is purified and restored after every wash.
Playa Endless Summer Spray ($26.00 for 3.65 oz. from Playa, Violet Grey, Shen Beauty, Revolve, The Dreslyn and Carbon Beauty Amazon Store): If you love soft, tousled beach waves, or textured curls, then this endless Summer Spray is a dream-come-true. It defines hair, and adds shine, manageability and volume. It is, in a word, incredible! It has an alluring warm, creamy fragrance that is hypnotic and indescribably luxe! Made with sea salt harvested in Southern California, this formula gives you the perfectly tousled hair texture you usually only get after a day at the beach or out on a board. Our proprietary Marine Collagen Complex nourishes strands to add fullness and shine; natural UV filters shield hair and scalp from harmful rays. Your hair is protected and looks effortlessly un-done. Directions: Mist throughout damp or dry hair. Use fingertips to tousle at the roots. Apply directly to exposed areas of the scalp to protect against sunburn. 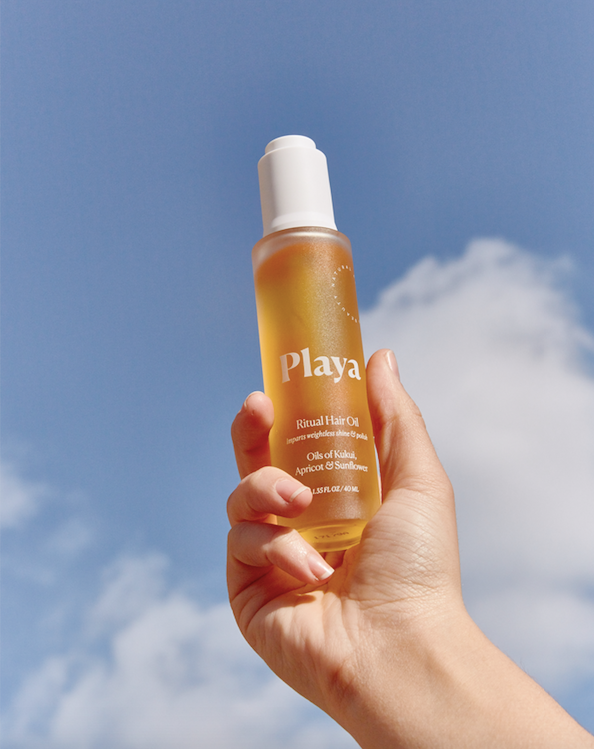 Playa Ritual Hair Oil ($38.00 for 1.35 oz. from Playa, Violet Grey, Shen Beauty, Revolve, The Dreslyn and Carbon Beauty Amazon Store): Be still my beating heart was the only way to describe my reaction when I first opened this fetching golden elixir. Given my penchant for luxury oils, this was most certainly my most eagerly anticipated product from Playa. The first thing that I noticed when I opened this bottle was its addictive otherworldly aroma: It is deep, warm, creamy and intoxicatingly beautiful. After luxuriating in the scent, I was swept away by its refined and silky-smooth texture. It is feather-weight and it quickly penetrates and nourishes the hair, and does so without the use of any silicones. Instead it is filled with natural oils, that are suspended in an ultra-hydrating base of coconut oil, and together they tame frizz and fly-ways, soften and hydrate the hair, and leave hair smooth and shiny. Hair is neither weighed down, nor is it left feeling oily. This hair oil is utter perfection. This weightless blend of natural oils penetrates deeply to radically transform your hair without the use of harmful silicones. Apricot, kukui, and our proprietary derived coconut oil blend restores moisture to soften strands; sunflower oil tames frizz and makes hair shine. Your daily ritual for smooth and radiant hair. Directions: Press once on cap to extract the ideal amount of oil. Rub between palms. Smooth through damp or dry hair from mid-length to ends. Apply prior to swimming to protect hair from UV damage, chlorine and the drying effects of the ocean. Preserves color. Gift with Purchase Exclusively from Playa: Receive a complimentary Ritual Hair Oil with any purchase over $50. Buy a gift to give & get a little something for yourself. Just in time for your last minute shopping, get free shipping on all domestic orders. Use Code: PLAYAHOLIDAZE at checkout. Offer ends Friday, December 22, 2017.